Manchester United have been linked with a number of attacking players so far this summer, particularly down the right wing. It is an area where Jose Mourinho tried out a number of players last season but never seemed settled on one. Juan Mata, Marcus Rashford and Jesse Lingard all got a run out here. 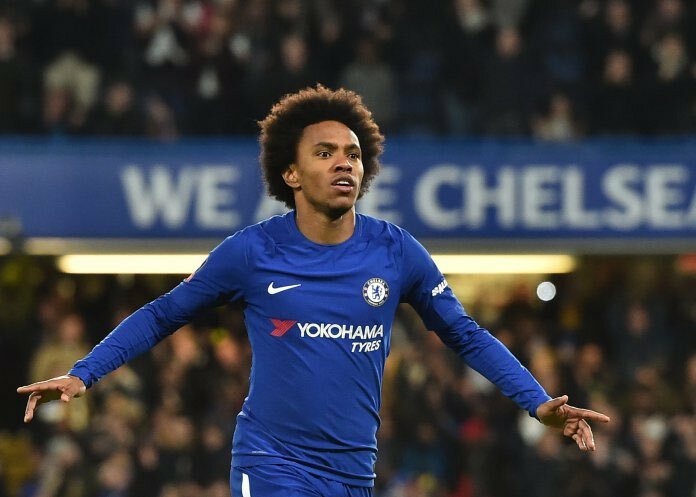 One player who has strongly been linked with a move to Old Trafford during this transfer window is Chelsea right winger Willian. The Brazilian previously played under Jose at Stamford Bridge and it appears our boss wants to reunite at the most successful club in English football. Willian himself put doubts over his future in West London earlier in the summer when he said he’d leave if Antonio Conte remained Blues boss. However, Chelsea finally sorted their act out earlier this week and appointed Maurizio Sarri as their new boss. As well as us, Spanish giants Barcelona have also been linked with a move for the 29-year-old. Following the sale of Paulinho earlier this month it appears the Catalan club want to bring in another Brazilian as it is a nationality that love. Sky Sports understand that Barcelona have lodged their third bid for the Chelsea winger; an offer of £55 million. It is a fee that Manchester United wouldn’t have a problem matching. However, one would think it is unlikely that Chelsea would accept an offer from a Premier League rival. The report does not state whether the Blues have accepted Barcelona’s offer or not, but one would have to assume that given the player’s age, there’s a fair chance they will. Though the ultimate decision will likely come down to whether the new manager has big plans for the player or not. We shall have to wait and see what comes of Barcelona’s bid and whether the Manchester United hierarchy will react or not.